Gabriele Hammelrath, SPD education politician (MdL) and Ehrenfelderin, now paid a visit to the BilinGO Campus in the Agnesviertel. This was arranged by the VDP NRW. The pupils from grades 7 to 13 had many questions for the politician. At some points her passion for the subject of school became clear. Ms. Hammelrath is a proponent of the comprehensive school system and argues for an education that is oriented towards the head and heart of the pupils and not the income of the parents. She reported on the G9 and government changes in Düsseldorf and the changes for the schools. She also readily reviewed a typical working day in the state parliament. The pupils could only congestion about the enormous workload. Mrs. Hammelrath promised another visit. We are looking forward to it! The BilinGO Campus School in Cologne invites all interested students and their parents to the Open Day on Saturday, 17.11.18 (10:00 – 13:00). The only bilingual comprehensive school in Cologne will present its innovative and successful language and pedagogy concept and visitors will be able to get a taste of the lessons and talk to teachers and the school management. There are many activities on the school grounds and the children are also provided with sports and games. The BilingGO Campus is located in the north-western Agnes district and is easily accessible by car and public transport. 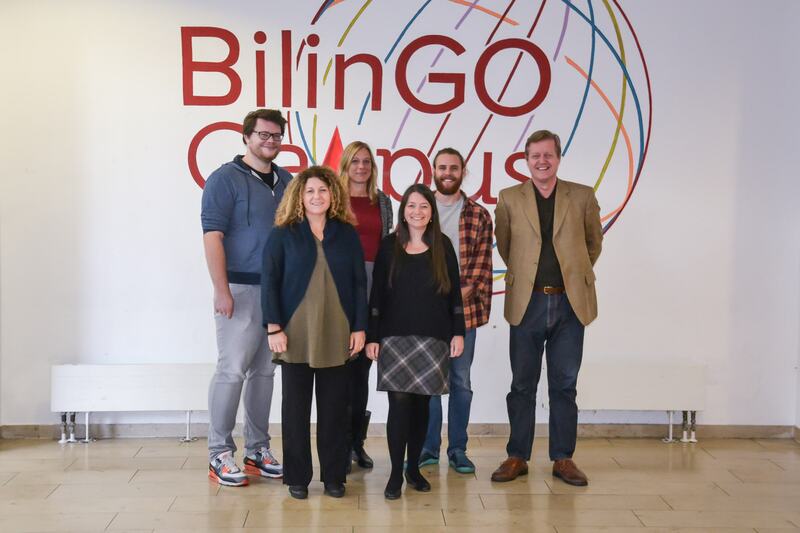 The BilinGO Campus Gesamtschule in Cologne starts the new school year with a new school management team. Nathalie Herkrath holds the position of acting Principal. Raffaella Durante-Müller is the head of Didactics and Pia Klein (Sek I) is the coordinator for grades 5-10. Levin Korell coordinates the upper school in grades 11-13, and Steve Gillies coordinates the bilingual department and concept.